Wide range including budget cards, Spot UV, matt, gloss & satin celloglazed cards + silver & gold inks. Our CMYK offset and digital printing ensures your single or double-sided flyers are crisp as chips. Available on gloss, matt, uncoated and recycled stocks. Pull-up banners are a popular sign used for portable branding and messaging at trade shows and events. Check out our full range! We have an extremely wide range of self inking stamps, traditional stamps, date stamps & common seals. Huge selection of premium quality colorbond and corflute a-frame signs, in small to extra large sizes. Some of Australia’s most competitively priced duplicate and triplicate tax invoice and docket books. Go every meeting prepared with a smart looking folder for your documents. Fully customisable for your business. 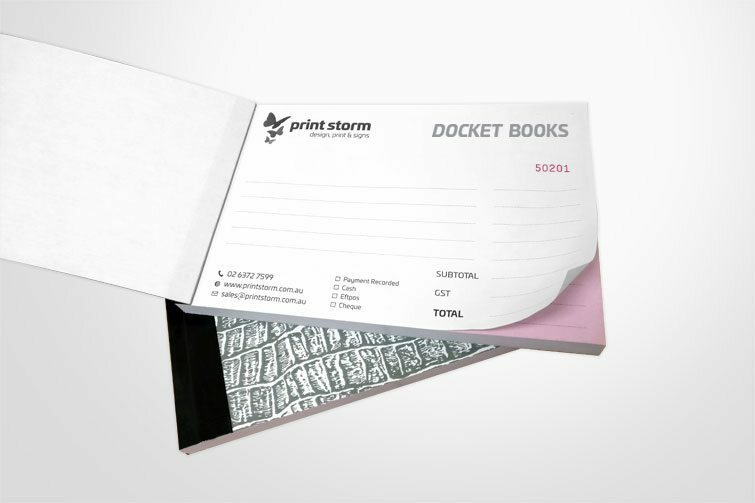 From letterheads to with compliments slips, through to docket books and self inking stamps. We've got it all. Custom printed envelopes. Self seal, press seal, peel & seal. C4, C5, DL, C6... basically whatever size you can think of! High quality stretched canvases, available in a range of sizes, professionally stretched and delivered countrywide. Welcome to Print Storm, where companies and organisations right around Australia come for their design, print, signage and web design needs. When it comes to everything marketing and communication, without the premium price tag you’d expect to pay, Print Storm has got you covered. With fast inhouse digital and offset presses we don't muck-around with your order. We produce high quality printed collateral using only the best equipment and paper lines. Excellent customer service, second to none. Great attention to detail and a fantastic final product. Print storm is definitely my go to print house for everything I need. Fantastic service and staff who always try their best to produce a quality product that you and your business would expect. Prompt and reliable every time. Each year for the past several years, the Program & Menu for the annual Rylstone StreetFeast has had the design finalised and the printing done by Print Storm. Staff are very professional and the finished product is of a high standard. Don’t delay, call 1800-2-PRINT today! © Print Storm. All Rights Reserved.